In 2018, Bendix produced nearly 2.5 million remanufactured components across its broad product lines. 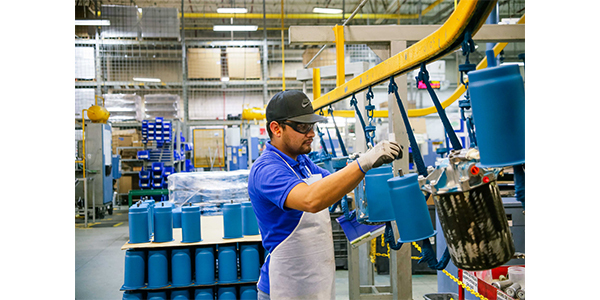 Here, a Bendix employee remanufactures Bendix AD-9 air dryers, produced at the company’s Acuña, Mexico, facility. When it comes to remanufacturing, Bendix Commercial Vehicle Systems LLChas long extolled its advantages, from quality to cost-savings to sustainability. To put the benefits in numerical terms, the company cites 5,392 as one example – that’s how many tons of raw materials Bendix saved last year thanks to the metal components it reused in its remanufacturing operations. Another figure is 18,874 – the reduction in the company’s carbon footprint, measured in equivalent tons of CO2. As it marks Global Reman Day on April 11, Bendix continues its emphasis on the benefits of remanufactured parts, while reaffirming the company’s decades-long commitment to industry leadership in remanufacturing. Global Reman Day, an initiative of the Remanufacturing Industries Council, is an occasion to advance the remanufacturing industry through remanufacturer-hosted events and workforce development programs. In 2018, Bendix produced nearly 2.5 million remanufactured components across its broad product lines. What qualifies as a genuine remanufactured product? Global Reman Day offers another opportunity to revisit the ground rules. According to Foxx, remanufacturing is not to be confused with rebuilding – the terms are not interchangeable. Rebuilders may just reline brake shoes with new friction, instead of coining to return them to the proper OEM geometry. Also, OEM-level remanufacturers, like Bendix, conduct much more stringent postproduction testing, because they have the resources, rigorously monitored practices, and deep expertise already in place.